This episode corresponds to Lesson 3 and Lesson 4 of our online course. We join Director of Recycling Bridget Anderson to discuss the DSNY’s extensive outreach and education strategy for their curbside organics collection pilot program in New York City. We explore how they dealt with the different demographics in the city, how they used online social media and traditional media, the importance of face-to-face communication, the reasons why people don’t participate, and much more. Thanks to If You Care for making this episode possible. If You Care Certified Compostable Bags are made from potato starch from starch potatoes, blended with a fully compostable polymer, and are polyethylene and plasticizer free. Their potatoes are grown for starch only unlike corn which is grown for food. Their potatoes require forty percent less land than corn and no irrigation. For more, visit their website. Q: You touched on some of your strategies in the last episode, but I’d like to really understand the whole process. Can you tell me how the DSNY went about planning and implementing these strategies? BA: Entering into a pilot program for New York City is a big challenge, because you have so many different types of communities and people with so many different experiences living in different types of housing structures. So we really approached this pilot from the perspective of what’s been successful in other cities? Most other cities have lower housing density – in New York City sixty percent of our population live in high-rise apartment buildings. So we started focusing on the lower density areas of the city. In those low density areas, we reached out to the elected officials and the local community organisations to get feedback. Part of the strategy was to look within at sanitation and our sanitation workers know best what is happening on the ground – what neighbourhoods tend to be good recyclers already, and what neighbourhoods they think would be more amenable to doing a pilot program. Based on that, we chose a few committees; we reached out to elected officials; we talked to the local community organisations; and we tried to identify those “informal mayors” of neighbourhoods that might have their finger on the pulse of the community, to get feedback on if they think it would be successful in that neighbourhood and where the challenges might be. Based on all of this information, we finalised our initial list of pilot areas, and then we sent a mailer to the households in the neighbourhoods about a month before the program was to start. Then we followed that up with a door-to-door door hanger that explained the program and that in a week they were to receive a brown organics bin, a kitchen container and information about the program. And then, when we do the bin deliveries – the organics bin, kitchen container and information packet – we have outreach people there during bin deliveries to talk to people on the ground; if somebody comes out and they have a question, we answer it. During those periods, we’ve encountered people who are just so excited about the program, and we’ve also encountered people who say “this really isn’t for me”. So we really try to change hearts and minds, and having people on the ground, and face-to-face communication, has been critical to getting people to even try the program. We say that it’s a voluntary program, that you won’t get fined for not participating, but we encourage you to participate, and this is why: your going to help reduce the materials that we send to landfills that potentially could save taxpayer money, you could reduce incidences of rodents in the neighbourhood; it creates a cleaner waste stream for you, because you’re separating out the stinky stuff from the rest of your garbage. So, that on the ground, face-to-face, has been critical. It’s resource intensive, but it really has been extremely helpful to get the program off the ground in the beginning. We also try to get articles in local newspapers – like the Daily News, New York Post, New York Times, if they’re interested – and then we have the local neighbourhood newspapers, and those have also been really helpful to explain that the scheme is coming to this neighbourhood, and that this is what it looks like, this is where you go for questions, this is our website… So they’ve been really helpful to get the message out. Q: This strategy mirrors the strategy we lay out in Lesson 4 of our online course when we speak about outreach – that you need to let them know about the program initially around a month beforehand, and then have people going door-to-door to answer questions when the bins are delivered. And that’s exactly what you did, so it’s a very extensive campaign. BA: Yeah, we’ve built email lists and newsletters, and any opportunity we can find the get the information to the local community, we use it. Q: Since there are so many different demographics in New York City, did you have different approaches that you used for the different groups of people? BA: We had our standard approach, but in certain neighbourhoods, we had people on the ground who spoke the language. We had a Spanish speaker, a Chinese speaker, we also had a few neighbourhoods where Russian was an important language. So we had people on the ground so they’d have that specific face-to-face opportunity to speak with somebody in their own language. We also translated some of our materials – the most critical pieces of information – into multiple languages, and you can translate our website, so that’ been very useful as well. One thing we have discovered is that, especially if you’re in an area that has a lot of retired people, we can’t rely on the web or social media as our only information portal. So, we have a hotline and utilise the city’s 311 program, and we have a lot of soft responses to the most common questions that we get. So we’re able to utilise phone calls as well as an opportunity. Q: What were the most common questions that you got, or the most common issues that people had? BA: We get a lot of questions like “is this mandatory, do I have to do it?” Because I think some people get the mailer and, even though it says it’s a voluntary program, they assume that because it’s a notification from the Sanitation Department, they have to participate. We encourage people by saying “it’s not mandatory, but we encourage you to try, because this is a new strategy and we’re trying to see if we can make it work in New York City”. One of the strategies that we’ve recommended to people that using certified compostable bags is one way to collect the material inside your home and get it out to the brown bin in a way that’s more similar to maybe what you used to do if you used plastic bags for garbage. The availability of those compostable bags has been a problem. It’s taken us a while to get the bags into retail stores – there are also online outlets for the bags. The price of the bags has been a problem; some people say the bags are to expensive and they won’t use them, or that they would participate in the program if they could use the bags, but the bags are too expensive – that’s an example of something that’s been a challenge. We do say that you don’t have to use compostable bags: you can use paper bags, and you don’t even have to line your kitchen container at all if you don’t want to, it just means you have to rinse it out. And with the brown bin, you don’t have to line the bin if you have a way to rinse it out, or you can use paper bags or certified compostable bags. And this spring we’ve added that people can line their brown bin with a clear recycling bag. It’s not our preference to do this, but to encourage participation and because the compostable bags are not yet available everywhere, we are allowing people to do this to get people used to the program. Our hope is that eventually the compostable bags will maybe become cheaper and be more available, and then we can switch out the regular plastic bags. One of the challenges with the plastic is that it doesn’t break down in the composting facility, so it adds to the contamination rate, but at this point we do think that it does encourage more participation because it’s more similar to our other recycling programs. In our recycling programs, you can use clear plastic bags, or you can put things directly in the bin, so it’s more parallel right now to those programs. BA: Right. There’s the challenge of the front end, which is participation, and then there’s the back end, which is trying to do something useful with the material. And we’re trying to balance those two things right now. Q: And in terms of strategy, would say that the face-to-face communication is the most important aspect? BA: I don’t know if it’s the most important, but it’s a critical piece. I think getting articles in the media and generating a buzz…and we’ve been very lucky where the local television news media has picked up the program, the local neighbourhood newspapers have picked up the program; the city-wide newspapers have picked up the program and we’ve had radio shows pick up the program too. Having people hear repeatedly about the program has been absolutely critical. Then, once an area becomes a pilot area where people are receiving the program itself, the on the ground outreach has been extremely useful. Not everybody reads the mailers: if you receive a mailing from the city, it might end up directly in your recycling bin – hopefully your recycling bin! And so, having people out there on the ground during bin deliveries to really make sure people understand the program is important. The elected officials and community boards have also often hosted meetings where people can come and ask questions. I think what’s critical is that you try to hit every outreach opportunity that you can, because you never know who might be listening in which venue. And the bigger the program goes, the more difficult it will be, because of the more neighbourhoods we’ll have, and we’ll have to be really efficient in how we implement the process, because we won’t necessarily have an army to be in every neighbourhood all the time. Q: And since you are planning to expand, is there anything you’re gearing up for, or planning, in terms of outreach campaigns for when the program does go city-wide? BA: So this year, we’re working through the analysis to figure out if we are able to expand this program, and really think about it as a program that we’re going to expand city-wide – we’re working on this right now. So, we have plans to further expand in the spring to another, approximately, forty-thousand households. And this fall, we’re aggressively trying to recruit more multi-unit buildings to really understand the challenges to making this work in multi-unit buildings. Then, next summer of 2015, we will start writing up our analysis and provide the city-wide expansion plan. In the end, when we expanded recycling, we started recycling in portions of the city and then expanded city-wide, we took a geographic strategy, where we said “now we know we’re going to go city-wide, let’s phase in each area of the city”. It is likely that that would be a useful tactic also for this type of a program once we expand it city-wide. But we haven’t yet crunched all the numbers to understand exactly how quickly it would happen and who would start first – those types of things. Q: Since you brought up high rises, I want to ask, what was your experience in dealing with the building owners and supers – were they on board right away, or was it hard to convince them to change? BA: We’ve been lucky at this point because we’re recruiting buildings, and they are voluntarily saying to us that they would like to join this program. I would say one of the most interesting things to date is that it’s the co-ops and the condos – the buildings where people own their units – that tend to be much more interested in the program than the building management companies for rental buildings. Where you have a co-op board, the co-op board president is perhaps the champion of the program, they’ve really been successful in getting buildings on board and participating, and committing to manage the program in their building. Where we have a resident of a rental building contact us, we then contact the building management company, and more often than not, the building management company says “I know this resident is interested in the program, but I don’t think I have the resources to manage it”. So we’re really working this fall to see if we can get more rental buildings on board to understand what the constraints are for a rental building as opposed to an owner building. Q: In general now, how has the reaction been from the participants of the scheme so far, has it been mostly positive, or have there been any comments on it? BA: It’s mixed. I would say you have the core group of residents that are really into the program; they’ve jumped on board and have given us feedback like, “I have no trash left!” and things like that. You do have, I would say, a significant set of residents who’ve chosen not to participate, and that’s the group that we’re really trying to recruit now. So we’re going back into the pilot areas and saying “you know, this really is beneficial and will make your trash management cleaner”, and things like that. But we really have a mix. The people who participate are gung-ho about participating and enthusiastic, and then you have folks who are really choosing not to. It’s interesting when you look at the numbers; we have RFID tags attached to the brown bins, so when we go and collect, we’re able to see how many bins are placed out on each collection route and are able to get a sense of participation, which is really helpful for the pilot program. And what we’re finding is that there are some people who started in the program, and then they dropped out, or they dropped out in the winter and they came back again in the spring – and so you can see patterns there. You also see, surprisingly, bins that had never been placed out for collection for three or four months, and then all of a sudden you see them being placed out for collection. So maybe that’s somebody who really wasn’t interested in the program and then saw their neighbours do it long enough that they said, “maybe I’ll five this a try”, or maybe they have a lot of yard waste and thought, “maybe I’ll use this for yard waste”. So we’re trying to understand the patterns of behaviour. How do people behave with the program? Is there consistency with participation? It’s a pretty interesting analysis to understand people’s behaviour. And it’s a different thing from recycling – recycling is dry goods, so that “ick” factor doesn’t exist, whereas with organics it’s a little bit different. Yard waste is less scary than the food waste portion of course. But we have really great testimonials of people who say, “I really don’t have much garbage left, once I recycle and do the organics”. Q: I often wonder about the people who start and drop out – what their reasons where. And it’s probably more difficult to get them back into the program again after that too. BA: Yeah. And our feedback is that some people say “I had a free sample of compostable bags, and once those bags ran out, I tried to buy them and I couldn’t find them”, or, “they were too expensive.” So for those people, we tell them that they don’t have to use those bags, and list the other strategies we encourage them to try. There are some people then – it was a particularly tough winter last winter – and they said, “you know, I just didn’t want to do the program over the winter, but now that spring has arrived, I’m coming back.” It really is varying reasons. Q: And finally, do you have any advice on planning and implementing an outreach program, for those listening in who might be starting their own? Any pitfalls you want to warn against, or tips to share? BA: If you have ideas of which communities you think you would like to start the program in, I would recommend having conversations with those local communities pretty early on. Give yourself at least a few months before the program starts to really start talking to that community, explain the “why” of the program: why are we doing this, and explaining how it would work. The more they feel a part of the development of the process, the better the response. I the very pilot area, we had a situation where certain people were told that this was going to be the pilot area before they were notified on a local level, and they felt a little bit slighted. So it was important for us, moving forward, to really get into those local communities. These are our candidate pilot areas: let’s get in there and talk to them and make sure they understand the program that’s coming. And then, when it comes, they’re not surprised. So having that up-front communication before the program starts would be an important piece. I also think providing the tools – providing the bins and the kitchen containers – has been helpful. Giving them the tools so they didn’t have to go buy things right away was really helpful. In the initial pilot areas we had sample supplies of compostable bags so they could at least get themselves started, and that was also helpful. This episode corresponds to Lesson 4 and Lesson 5 of our online course. In this episode we take an in depth look into the expanding organics collection and composting program in New York City. We speak with Bridget Anderson, director of the Recycling Unit of the DSNY’s Bureau of Waste Prevention, in order to understand the unique situation that a megacity faces when rolling out such a program, the logistics and strategies for setting up the scheme, challenges in dealing with different building types, managing the collected organic material, and the vision they have for the future. IPL is a leading North American manufacturer of injection-molded plastic products. The commercial success of products and technologies often depends on innovation, and IPL specialise in providing added value and expertise for all your projects. Their unique and innovative processes are tailored to design, develop, and deliver the best solutions for their valued customers. For more, visit their website. Q: Can you tell me how the program got started? BA: Organics collection was a pilot that actually started in the schools, in the 2012-2013 school year. We started on a select number of schools and focused on school cafeterias and school kitchens; and it was really an effort that was spearheaded by a number of parent-teacher organisations. They did a great job and Sanitation saw what they did and decided that we would try in on a slightly larger scale. Then there was momentum to try this in residences also – in homes. And we’re in all five boroughs: we have pilot areas in the Bronx, in Queens, Brooklyn and Staten Island – and then in Manhattan, which is a very dense area with lots of high-rise apartment buildings, we actually have selected apartment buildings that have volunteered to participate in the program. One of the challenges is to figure out how to do this in high rise buildings. Q: How does the pilot program operate today? It is a voluntary program at the moment, correct? BA: Yes, the pilot is voluntary. We chose the pilot areas in a combination of where, collection-wise, we thought it would work well operationally, and where there was interest among residents and among elected officials. We also looked for those low-density areas. So, it was voluntary and not everybody in the pilot areas chooses to participate, but everyone is given the opportunity. What we do is we send a mailer to everyone in the pilot area, saying “this program is coming, this is what it is and you can expect to receive your brown bin”. Then about a week before the brown bin arrives, we do a door hanger. We go door-to-door and hang a door hanger and say “Your brown bag is arriving this week. As a reminder this is the program, it’s voluntary, we hope you participate, and this is how it works”. And then when the brown bin arrives, in that brown bin is the kitchen container and the brochure that gives details about what can and can’t be put in the bin – best practices for how to manage the material. BA: Yeah, it’s interesting, they approached us. One of the pilot areas is where the mayor’s home is – this is the mayor’s home before he moved to Gracie Mansion, which is the official Mayor home. He actually approached Sanitation and said “I would love to do a video. My daughter Chiara is very interested in this program”. And so, we developed a script for them, which they took and then tweaked, and they created the video. And the video turned out beautifully – I thought it was a great video. And now they’ve moved to Gracie Mansion, and we had the organics collection program in Gracie Mansion with Mayor Bloomberg, and now we’re continuing it with Mayor de Blasio, so we’re very excited about that. Q: I want to ask you about the expansion on the program to high-rise buildings, because as you said earlier they can be quite a challenge. How did the DSNY decide to deal with all the different types of buildings? BA: There are other cities in the United States that already do this organics collection program – cities like Seattle, San Francisco, and Toronto in Canada – and we looked at what they were doing, where they found success. Most of those cities are lower density and don’t have as many high-rise buildings. Toronto is maybe the closest to New York City in comparison to a place that already does organics collection. And we thought, let’s try this program in the lower density areas of the city – because that’s where there’s been a precedence set to have a successful program in other cities. So, we looked for parts of the city where we would focus on single family homes and small apartment buildings that are up to nine units – little town houses, brownstones, and then small apartment buildings. The pilot areas are primarily that size of building. Q: And how many high-rises are you working with at the moment? BA: We have over a hundred high-rises at this point. Q: That’s quite a few. And what has been the DSNY’s strategy in dealing with the various building types? Do you have separate systems, depending on the high rise, or is there a single system that works across the board? BA: I would say we service a different range of types of buildings – we have old, old buildings, we have brand new Leed certified buildings…a lot of it depends on the infrastructure of the building, where there’s space to put the bins. It’s very similar to recycling – where is there space to place the bins, either on each floor or in some sort of centralised area, where people can then bring their material to drop it off. And then the building staff brings it out to the curb. So we have a few different strategies that are the most common. One is, if our large buildings tend to have chute where people will take their trash, and it foes down to the basement. In a lot of buildings there’s a little chute room where the chute exists. And if there’s space on each floor, and the building management are willing to provide the service, we recommend that both the recycling and the organics containers are put in those shoot rooms on every floor. It’s the most convenient for the residents. That doesn’t exist in all buildings, so what’s also quite common is a centrallsed location on the first floor, possibly the basement or in the area nearby where there’s parking, where the recycling and organics bins are placed. And that’s more of a centralised area. It’s less work for the Super to service, because it’s only location – but it’s potentially a little bit less convenient for the residents because they have to go downstairs. We find with both recycling and organics collection, convenience begets participation. So if it’s easy and convenient, people will participate. The people who want to do it are going to do it no matter where you place your collection location; the people who are saying “well I’ll do it if it’s convenient.” If it’s easy for me to just throw it down the chute on my floor that to bring the organic material or recycling downstairs, then you may lose a few people in participation. So, we have a lot of signage – signage is absolutely key to let people know on every floor where the collection location is in the building. And keeping the collection well lit, safe, secure is also key to having people comfortable with using those locations in the building. Q: Another crucial part in organics collection programs is the collection times. How did you decide on collection times and are they different from place to place? BA: We have a few different strategies. About fifty-thousand of the households are being offered twice a week collection, and that’s the same frequency as refuse collection. The idea is you just set out your material on collection day, but you separate the organic material from the waste and recycling. In the other half of the homes, we’re testing once a week collection. Basically, the way things work is that here you have twice a week collection of trash, once a week collection of recycling in most parts of the city, and so we’re either offering twice a week collection on the same frequency as trash collection, and the other half od the pilot, we’re offering once a week collection on recycling day. So, it’s essentially just another recycling stream to set out on your recycling day. Q: Do you know which one is more successful, or which you’re going to pick in the long-run? BA: We have one area of Brooklyn, where we started them in the Fall with once a week collection and switched them to twice a week collection in May, so we’re going to be studying that one. We don’t have any results yet, but we’re hopeful that that little neighbourhood – it’s called Windsor Terrace – will actually help inform us what the effect is of twice a week versus once a week. Q: Was it difficult, in a city the size of New York, to plan collection routes and to cooperate with the haulers? BA: So in New York City, the city actually has a municipal hauling workforce and we collect material from residences, agencies and institutions. And so, it was simply a matter of making the case to add some to add trucks in the budget to service the same routes. And we chose the pilot areas so they were co-terminus: they were the same areas as the regular routes, so there was no issue there. People were very positive about piloting the program. Q: The ultimate goal is to make this a mandatory, city-wise curbside composting program. How are you planning to get there? BA: The city council passed a law for us to conduct this pilot program, and the our mandate is a two-year program. And in the October of 2015, we will have to present a report to city council and say, this is how the pilot went, these are our recommendations moving forward. And so far we feel pretty positive about the participation, about people’s understanding of the program. We’re working right now to evaluate the pilot to understand what the best practices, what are the best collection frequency, what are the other aspects of the program that we’d want to take and scale up. Scaling up city-wide is going to take quite a while. It’s not going to happen overnight; it will have to be a phase-in process. And part of it too is that what happens is if you separate the organic material and recycling fully, you don’t have as much refuse left. So, one of the big pieces is understanding how we reconfigure our routine and our truck routes so that we manage the material differently. So, maybe we don’t need as many refuse routes because there’s not as much refuse being set out as we add the organics routes. So there’s a lot of operation pieces that we have to put into play. There’s also the aspect of geography – do we roll out district by district, which is maybe what happens. So, we’re basically in the planning process right now as we roll out the pilot, to figure out how we would do this city-wise, and I would say that it’s going to take ten years to probably get to the entire city. Q: We tackle this whole aspect of organics collection programs in Lesson 4 of our online course on Compostory.org, so those of you listening, can go straight to the course on our site and take a deeper look at. And now, I’d like to touch on the topic of community composting, because in our last episode, we were taking a look at the community composting movement in New York and we know that the DSNY has been quite involved in supporting this as well. Can you tell me a little about how you work with community composters in the city? BA: Yes, we have a longstanding relationship – over twenty years – working with community composters. The New York City Compost Project is a group that we run and fund, and we have non-profit partners throughout the city where we provide education services – helping people to understand how to compost in your backyard, if you want to take your yard waste or your food scraps and do it yourself. We work with community gardens, and we provide finished compost from the material that they city collects and manages, and we provide tools and equipment, and technical advice for how to set up composting in community gardens. We also work to provide drop-off programs. We have food scrap drop off programs throughout the city – we’ve about seventy in operation right now. And those drop-off programs are critical, because they get people in the mindset of “oh! this is what this is…I take my food scraps and I can bring them somewhere else and recycle it – have it be composted.” So, we see the community composters as absolutely critical to helping people understand the concepts of organic separation, what happens to it, what are the benefits to it – it’s an absolutely critical piece to the puzzle. Q: So you agree with David Buckle, who we interviewed last week, that community composting is an essential part of creating a successful organics recycling system? BA: Both programs are very important, yes. Q: When speaking to David, it was clear that he had concerns about a lack of vision from policy makers in the city, that might not understand the importance of local collection and composting and wouldn’t necessarily prioritize community composting over other collection systems. What’s your take on this statement – have you seen this yourself? BA: I actually have not seen that. We’re trying to position the city, in terms of organics waste collection, to fulfill a number of goals, and community composting plays an extremely important role in terms of introducing the community to organics and composting and the concept that you can recycle this other part of the waste stream, and to showing what actually happens to your organic waste, how it turns into compost; and creating a valuable product for the local communities. The capacity for local, small-scale community composting is too small to handle the vast hundred and thousands of tons of material that we’re looking to divert through organics recycling. So, we as a city also have a parallel mission to find how we bring composting to scale and actually move major tonnage of material to recycling, to composting and to renewable energy. So, for us we see both as extremely important, because the local community composting creates beneficial use for the city. They have been critical to introduce the concept that this is a useful strategy but it’s not going to help us divert all of the waste. 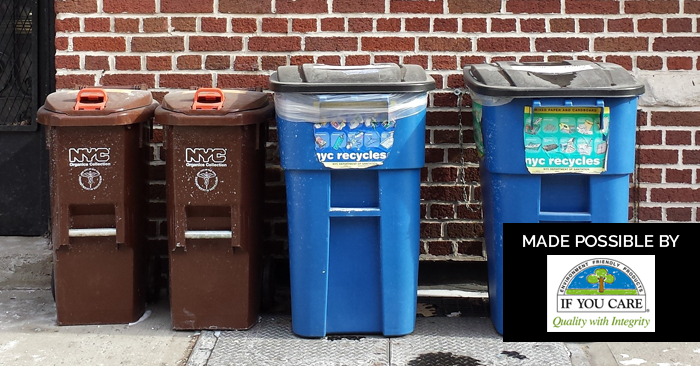 There’s so much waste in New York City, that we don’t think we’d be able to handle it through community composting. You have to have large, permitted facilities to really handle that quantity of material. But there’s plenty of material to go around, and absolutely – this is why we fund local community composting operations – we see it as a critical piece to the pie, a piece to the puzzle. We’re really focusing on [understanding] how we create this as a cooperative program. But it’s really tough, I mean, you have people who’ve been in the trenches for two decades working on local community composting, and I understand that maybe there’s a fear that if the city takes over this program that there won’t be a place for local community composting, and we do not at all see that as the case. They are both critical to achieving the city’s overall goal, which is diverting major tonnage of material, and creating beneficial use for local communities. Q: If the program is rolled out city-wide, you will have a lot of compost on your hands. What are you planning to do with the compost and what are you currently doing with it? BA: We take the material from the pilot to local and regional compost facilities. With the material that’s taken to the regional facilities, we don’t actually take back the compost at this point. There may be a situation moving forward where we develop a relationship where we would have a certain percentage of the compost come back. With the material that’s processed locally, we turn it into compost and use it in street trees, we use it in parks, we use it in gardens. 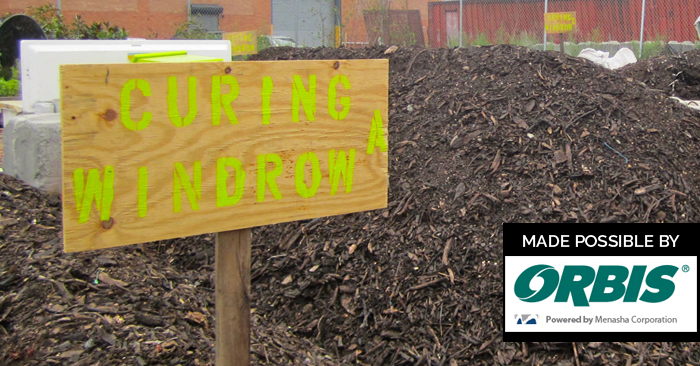 We have give-back programs for non-profits, schools and community groups, to use the compost for their greening projects. We also create a mulch product in addition to compost. And most of the material that we’re currently compost locally is yard waste, and that creates a beautiful mulch product as well as the compost. We also sell the compost to landscapers, so we do have a small revenue stream there. Q: Are you involved in creating markets for compost, or encouraging market growth for compost? BA: For the material we compost locally, we’ve worked on this landscaper market, and it’s really a bulk purchase type of situation. We have not gotten into the business of creating a retail market for the material – it just hasn’t been necessary to date, because we’re handling and selling all the material with the landscapers and with our give-back programs. With the regional composting facilities that are taking the material during the pilot period, we have not been involved in how they’re marketing the material, although we are evaluating with them the quality of the material we’re giving them, and the quality of the material that comes out, so we understand better what it is we can create from the material that would come out of a New York City stream. Q: What is the quality like, and what contamination rate are you experiencing? BA: The quality is quite good. In the residential program, our contamination rate is very, very low. It’s well below five percent. So we feel very good about that. It is a voluntary program, so the people who participate want to participate and try to do it right. That may change obviously when you make it mandatory. Q: Is creating a market for compost something you’re looking at doing in the future? BA: It would definitely be part of our larger plan. We want to ensure that the material is going to beneficial use – and is not just composting; we’re also looking into anaerobic digestion so we can create energy from the material. But creating a viable program, if there’s a way to generate revenue from it, that’s obviously a huge benefit, so it’s definitely something we’ll be looking into. Q: Yes indeed, and we just released a new lesson – Lesson 5 – of our course were we take a detailed look at market creation for compost as well. And in terms of your aims or objectives with the organic material – as you said, diverting materials from landfill and supporting communities are on your list. But what about the organic material itself and what it’s used for? Are you focused solely on creating revenue streams, with waste-to-energy for example, or are you more concerned with creating quality compost to help replenish the soil? BA: One of our biggest objectives is to find ways to reduce the material going to landfill, and the parallel objective is to create beneficial use. And obviously as a city we are concerned about being cost-effective in what we do, so any opportunities we have to market material and gain revenue streams is important. We are focused primarily at this point on the composting, because that’s a proven technology; we know there are existing facilities, we know that a useful product can be created and marketed. Anaerobic digestion is a little bit newer of a technology for us in the North-East. There are wastewater treatment plants that have been using anaerobic digestion for a long time, and the question is: how viable is it to utilise AD for a municipal organics program? What we’ve learned is that the challenges are when you co-mingle food waste and yard waste, and food soiled paper, that can cause problems with anaerobic digestion, and so we’re trying to figure out if those energy conversion technologies (such as anaerobic digestion), could be viable with our waste stream. We won’t be able to collect yard waste separately from food waste, we really need the efficiency of collection to collect it all together , and so the question is: is there an option to utilise anaerobic digestion with that type of material streams. On the commercial side, with businesses, we expect it’ll be food waste. So we think that there’s quite a good opportunity there for turning food into renewable energy through anaerobic digestion. But on the residential side, we think it may be more difficult. Q: So you’re going to stick with composting, which is probably the most ideal option on many fronts. BA: Yes. The challenges there of course is that you need a lot of space for composting – there are siting issues. For New York City, siting any new facility is expensive and difficult. There’s permitting processes, and because we’re right the confluence of three different states, each state has their own permitting requirements and procedures. Q: And for our listeners who are rolling out similar programs, we strongly recommend fully integrating the multiple benefits of compost use in the program vision. Keeping organics out of a landfill and managing the waste streams is important – and it’s usually the main argument to be had in large cities – but then programs need to take into account all the benefits of compost use as well when developing operations. We’re finding out that many programs need to put more focus on end-product quality. So there’s a whole ecosystem involved here and it goes beyond just the ‘waste management’ side of things, so it’s very important to include that in the program vision. And so Bridget, in terms of closing the loop as much as possible do you travel far to the composting sites you use, or? BA: We have one composting facility on Staten Island, and that’s a great system. So, all the material that we collect on Staten Island, stays on Staten Island, so that’s a very closed-loop and successful system. For the other material that we have, everything is within a hundred miles of the city, but we do have to truck it outside the city. And so, we basically say it’s regional capacity. And we’re hopeful that once we position ourselves to go to scale, that we will be able to work with companies who will local themselves closer to New York City. Q: The project has been a great success so far and it’ll be exciting to see how it progresses, but already you’ve gained a lot of experience and tackled a host of issues. I’d love to know more about the pitfalls and successes you’ve experienced on your journey so far. How has it been? BA: Yeah, so one of the best things that has happened is that we found these local resident champions of the program, and they are the best sales people. Having peer-to-peer interactions where people are explaining to their neighbours how great the program is, how little trash they have left, and how easy it is, has been incredibly helpful. And we found that it takes a lot of work, but the in-person interactions that we have as a program with the residents is really the most effective way to get people who may be a little bit shy, nervous or intimidated on board. We get a lot of questions and concerns about rodents and pests, and they say it’ll be more work. Well, we say it’s the same amount of waste that you’re throwing out now, you’re just putting it in a separate bin. And the bin that we have has a lid and a latch, and so we’re able to explain to people that it actually reduces the potential for pest issues because you’re containing that waste. Right now New York City has primarily a bag program, so material is placed out at the curb in bags, and when you have a plastic bag, it’s much easier for a rat to chomp into the back and access the food. If the food is in a container, it’s much more difficult for them to access that meal. So we’re working with the Department of Health to study how the rodent populations are affected by the program. We’ve also had some people say there’s been fruit flies and maggots, and those sorts of things. And it’s amazing because we use social media a lot in the program, and we often have residents providing best practices and tips to the people who have concerns about fruit flies and maggots before we even get to them. So, we have a list of best practices and tips, but we really do rely also on that peer-to-peer education. Q: And finally, for our audience who might be wondering how to start a similar program in other large cities around the world, what advice would you give for rolling out a system like this in a large city? BA: I would say that you need to have a plan for where you’re going to take the material. Don’t set up the front-end without the back-end in place – that’s critical. I would say the best way to roll-out the program is to do it so it follows the existing collection schedules and the existing behaviour patterns of people – so we said “add this to the recycling bay, they’re already setting out recycling” or “have them set it out on the same days as trash”. That way the behaviour is sort of the same, it’s just that you’re separating out the material. The stakeholder engagement has been critical, so speaking with the elected officials and getting them on board – they can be your best advocates in their districts. We found that not only the elected officials, but the local civic organisations have been critical. You have these informal mayors of neighbourhoods that really understand the neighbourhood and understand what messaging will work in that neighbourhood; is this a neighbourhood that will respond better to the fact that we’re trying to save taxpayer money? Is this a neighbourhood that will respond better to the environmental message? That’s been critical for us to target our education and our messaging. In this episode, of our now bi-weekly podcast show, we focus on urban community composting in New York City and speak to long-time community composter David Buckel from Added Value Red Hook Community Farm in Brooklyn to learn more about the movement and to discuss the importance of supporting urban community composting schemes to achieve true sustainability. We will explore the ways community composting can demonstrate a closed-loop cycle and educate the public about soil health and sustainability, how community composting fits into a larger organics recycling system and is an integral part of that system, the challenges NYC composting face and the opportunities on the horizon. Thank you to ORBIS for making this episode possible. As a leader in organic waste recycling, ORBIS has a wide range of plastic curbside organic recycling bins and carts to chose from to help you improve recycling rates, conserve natural resources and help the environment. With value-added educational programming, community outreach and environmental expertise, ORBIS helps communities meet their organic waste diversion goals while improving the health of the planet. For more, visit their website. Tune in on August 18th for the next exciting episode. Q: The community composting movement is growing strong in New York at the moment. The DSNY, for example, who started their NYC Compost Project in 1993 to support local composting programs, now support over 200 composting sites and 8 to 10 mid-size operations in the five boroughs, and the collection points for dropping off food scraps at greenmarkets are growing in number: over half of the greenmarket farmer’s markets are outfitted with a drop-off program. As a long-time community composter currently working at Added Value Redhook Community Farm in Brooklyn, you’re right there on the ground watching all this happening. Can you give me a brief picture of what community composting looks like today? DB: Quite a bit of it depends upon how you define community composting. There’s an awful lot of things going on in terms of community composting in the city; there’s quite a bit going on in terms of closing the loop, and a lot of that is in the community gardens around the city. Folks will bring their kitchen scraps to their community garden, where they get composted in small systems. What there’s less of is community composting that is defined not only as trying to close the loop as much as possible on organic material, but also engaging the public as much as possible, so that we can promote environmental stewardship. Q: Community composting has had a long history in New York, hasn’t it? DB: Community composting has been, to a degree, fairly strong in New York, because of the presence of community gardens around the city; New York City is unusual in having hundreds of community gardens. What’s new for community composting is adding in the public engagement, and trying to make sure that capacity grows more. The community gardens can take organic material to a degree, but at some point it’s just too much for them because their systems are usually quite small. So we’re trying to develop more sites that have bigger capacity and can take more organics. Q: In terms of a vision for community composting, many (including yourself) are in favour of small-scale, decentralised models that prioritise closing the loop, can you tell me what policy makers have in mind for community composting in the city? DB: We haven’t yet seen a strong vision articulated by policy makers for the future of community composting. What I have experienced is more helping what already is happening. So, assistance for community gardens and things like that. The Department of Sanitation has been very helpful in terms of developing slightly larger sites that can take more material, but I haven’t seen a vision that essentially articulates where we want to be in the future twenty years from now. Q: Why do you think that is? We know how challenging it is for them to coordinate all of the different aspects in such a large city, as well as rolling out such a large collection program. DB: Perhaps they haven’t been challenged enough to realise that this is the sort of thing we will have to confront sooner or later, because, to me, there’s no way to get around the future in terms of closing the loop on the travel of organics. We will, sooner or later, have to find ways to make sure organics are not travelling large distances in order to be processed. We think that’s the kind of vision that has to be articulated at the policy level. And then, everything else comes along with it: even if we optimise community based composting as much as we can, because our cities in the US are so badly designed, there’s no question that we will also need curbside pickup as a municipal function; we’ll also need commercial composting. We’ll need all of those things. What we’re not seeing is a vision that’s big enough and future-thinking enough to say that we have to optimise community based composting first and foremost, and then pull in all these other elements to best address the organics. Q: Before we tackle the bigger issues, can you tell us more about how things work today with community composting: how are the organics are collected & processed? DB: One of the most exciting things going on in New York City in terms of organics being collected is the farmer’s market collection program. It’s run by a group called Grow NYC, which has several green farmer’s markets around the city, and they have tables where folks can bring their food scraps from home, drop off their food scraps and then buy their food to take home, where they will make food scraps that then go back to the farmer’s market the next week. So it’s a wonderful, local cycle for the organics stream. The food scraps are distributed to different sites around the city, within the city limits, one of which is where I’ve spent a lot of my time called the Red Hook Community Farm in Brooklyn, New York. And so we will be getting that material from farmers markets in the borough of Brooklyn, closer by. We also maintain tumblers so that community residents who can’t compost at home can walk their food scraps over and put them in the tumblers, and that material will wind up in our larger system over time. Q: Do you see a lot of people participating in this, or is it gaining in popularity? DB: It’s growing more and more popular as people hear about it. They’ve just passed the three million pound mark in terms of the collections they have done, so it’s to be quite big of a scale, and they seem to be adding new farmer’s markets every year. So that’s very exciting. Another exciting development is that the Department of Sanitation has begun to support the development of urban farms, and you’ll see a very similar type of magic happening, because at the urban farms they will often have farm stands where they sell locally grown, fresh produce right next to the fields where the produce is grown. So folks, when they come, will bring their food scraps. And this is what happens in Red Hook, Brooklyn, because folks will come and bring their food scraps, drop them off in our tumblers, and then buy some produce at the farm stand and go back home and create a very nice local circle – a closed loop for the organics. Q: And how is the organic material typically collected from the farmer’s markets and urban gardens? DB: Well at Added Value’s Red Hook Community Farm, the material is brought to us. So, local residents will walk it or bicycle the material from their homes. And then we get some of the scraps from the Grow NYC farmer’s markets, which is brought to us in plastic bins by a truck. The big difference is that it’s just travelling within Brooklyn, as opposed to having trucks drive on highways and downs streets. We have a smaller truck, as opposed to the bigger trucks that get loaded up and then have to drive outside the city for a distance to transport the material. Q: One issue we often talk about with organics collection is the contamination rate, and the quality of the organics collected in New York has been described as pristine. Would you agree with that description? What has been your experience? DB: Well I can’t speak for the city, but what I see happening is that, in terms of the material collected at the farmer’s markets, we’ve very, very clean material that’s being dropped off – in particular because the folks who go to the trouble of collecting their food scraps and bring them to the community sites once a week are very conscientious, and so our level of contaminants are extremely low. Curbside Organic COLLECTION And COMMUNITY COMPOSTING – Can They Work Together? 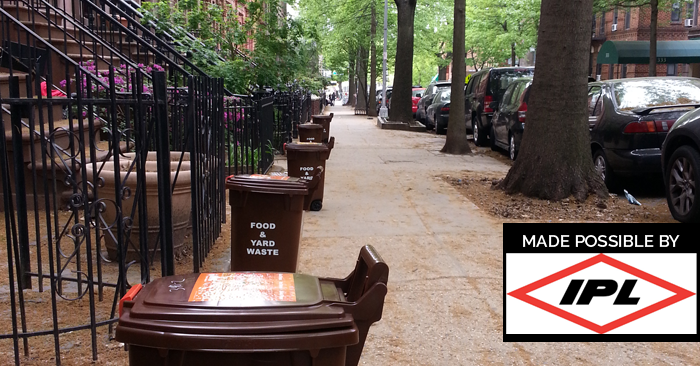 Q: With the DSNY managing an ever expanding residential curbside collection scheme for NYC, can community composting be an integral part of the system, or are they at odds with one another? DB: In my view they are in direct conflict and at great odds in some ways, and it depends upon the vision that is articulated for policy in a city. For example, when I started this work, I talked to some folks in Toronto, who were very active in trying to promote sustainability in regard to how organics were treated in the city. And they had a choice – they had to either support community composting and invest in it as much as possible, or invest their time in trying to develop curbside pickup. They chose curbside pick up, because they felt it could be a bridge to community composting, and they told me that the exact opposite happened. Because they had never developed a culture of people trying to keep their organics as local as possible, once the curbside started, it was very challenging to get to that culture, because people could just put things on the curb, and they got into the habit of that. So now what they’re looking at is a much longer time-frame for persuading the public that it would be better for their organics to stay much closer to home because it’s more environmentally sustainable. So in that way, Toronto shows that curbside municipal pickup and community composting can be at odds and in conflict, if there’s no vision of policy that says we need to be developing community composting as much as we possibly can, while at the same time we recognise that not everything can come to community based composting sites – we do also need curbside municipal pickup. But you see, that kind of vision doesn’t see them at odds. That kind of vision says: let’s do what’s most environmentally first, and develop community composting as much as we can, and then recognise we also have to do curbside municipal pickup, as well as commercial composting. That’s different from what happened in Toronto where it seems it was posed as a choice, one or the other, and now my colleagues up there are saying it will take them so much longer to ever develop community based composting. Q: That is something to bear in mind when developing policy. Now let’s move on and talk about the benefits of community composting. I’m sure you agree with me in saying that community composting schemes can really make an impact in educating people on organics recycling and the importance of keeping the stream clean? DB: That’s true. One benefit is that unlike glass or plastic, or metal, it’s much easier for the public to participate in the process when it comes to processing the organics. They can’t as likely do that with glass, metal or paper, but with community composting, they can go very close to their home, contribute to the compost process, and – if it’s a type of a site that places a value on community participation – volunteer in making the compost with their own hands. That has several benefits. One is that if the material is used in their community, they get much more invested in it, because they see that it’s going to be used for a local urban farm, or for street trees, or a food garden their local public school where kids attend. So there’s a much stronger connection to it, and more dedication and commitment. But they also just care more about it in general. So one effect, if it’s optimised, is that people will care more about what they’re putting out on the curb as well. So, they may take some to community sites, but if they’re putting some on the curb for pickup, they know the importance of not having contaminants if they’re participated at a community compost site, so they’ll be more careful that way. Q: On the note of education – how do you draw people in and get them interested? Q: That’s a great problem to have. DB: It is, it’s a wonderful problem. But it just further demonstrates the importance of community composting – that there’s a hunger on the part of so many to participate in this type of work. Q: For those out there that might not be convinced of the importance of community composting yet – can you tell us some more benefits you’ve seen? DB: At the top of the list, it’s better for the environment. It reduces environmentally costly transport by so many trucks on the streets. It better supports local food growing, and it also supports other green projects in communities. So, if folks want to green up their community with more street trees or flower gardens, or food gardens, there’s more compost available locally to do that. And then here in New York City, after the last hurricane we had, which was so devastating, by building up our urban soils and improving storm water management through community composting, we make ourselves more resilient in the face of climate change. The last hurricane, Hurricane Sandy that came through New York and so devastated us, made that all the more important. And lastly, over time, if we can develop community composting sufficiently, according to the broad vision of what’s the most sustainable way to live, it will generate jobs. We’re not there yet, but we’re trying – I’m actually running a job training program out at the Red Hook Community Farm, and the movement has to get much bigger in order to start generating jobs. Q: We’re very interested in creating self-sustaining models that benefit the economy and society as a whole – and this is an area that composting and recycling initiatives have a lot of potential. So apart from growing the community composting movement and the sites themselves, what are your main problems or focuses right now in creating jobs? DB: One important development we need now – and we’re so ready for this – is the generation of revenue models. I can’t help but say that if community composting is going to be successful, we need some kind of funding stream. The ones that have been developed commercial enterprises don’t work, because the goals are a little different. But on the other hand, community composting can’t be just a none profit endeavour, because you would wind up chasing grants all the time. And if one sign of success is that there are more composting sites, the problem you have is that the foundation pie (i.e. grants), gets smaller and smaller. So, much like with urban agriculture (at least in the US), the answer has to be to get a little more business-like and pay more attention to generating revenue, so that even when we continue to turn to foundations for grants, we also have some generation of revenue to develop financially sustainable models of operation. Q: In relation to this, what is the market like for compost at the moment in New York – is it strong? DB: It is. Before the hurricane we were able to meet the farm’s needs and start to explore some markets, and we found that many buyers are willing to pay a premium – to pay more than they otherwise would because they knew it was locally made compost and they wanted to support that movement. So there was this great, untapped market of people who wanted to support the local economy and keeping things as environmentally sustainable as possible. Q: New York is a very densely populated area, which I’m sure brings its own unique challenges to community composting. What challenges have you faced in the city? DB: One is the lack of the broadest vision of where community composting across five, ten, and then ultimately twenty-five, when we want it to be what it should be. So, as a result of that, people too superficially discount community composting with observations like “well, there’s just not enough land”, or, “Well, we can’t divert all of our organics to community composting, so we have to do municipal curbside pickup. The other thing is existing laws. Not that there was any bad intention in the creation of these laws. In fact, in New York City, some of the most applicable laws were intended to address the problem of organised crime being involved in the hauling industry. And that’s an important mission, but the unintended side-effect was that the laws impede the growth of community composting – particularly with regard to commercial organics. The current law does not allow those organics to flow unimpeded to community based compost sites. It’s been very discouraging because there are so many young people, in particular, who are very excited to be environmental stewards and to develop bicycle carting businesses, and things of that sort, and they’re deterred from the outset. And quite often they give up and turn to other environmental work. Hopefully we don’t lose them altogether, in terms of environmental work, but it’s sad that their passions get deterred at the outset. Q: That is very sad. But there is a petition started now to change the laws? DB: There is a petition now. Some folks are trying to get food businesses in the city to ask the city legislators to change these laws. The hope is that it will gain some force. But the problem is that there’s a lot of discouragement, because it doesn’t seem like the policy makers are “there”, and without that kind of support it can be overwhelming. DB: Oh, I think it will. Things are gradually changing. One of the big problems we have had is folks who are able to stick with it and keep trying often look for ways to educate themselves about how to be community composters. And unfortunately, up until now, in the compost industry all the educational materials are geared towards commercial folks. The downside of this is that a lot of people who do community composting will go to these trainings, and they’ll come back thinking that the answer to their problems is machines. So [they think] the way we can get more done is if we have a bucket loader, or we have a grinder. They start thinking the way a large commercial facility would think. And I can tell you from personal experience that once machines show up at a site, the people disappear. That’s a big problem when folks start reaching for machines, because then the other goal – to engage the public and get them involved – starts to disappear because the machines are there to do the work and the people see themselves as less relevant, and less important. But we’re just now starting to get some videos out, and some more information out, that is actually for community composters. Instead of coming from the compost industry, which really doesn’t think about community composters, it’s actually coming from community composters themselves. So there’s more material for other community composters to work with, so that they can keep their focus on people and on community. Q: For the final question – what advice can you give our listeners who might be starting their own community composting sites where they live? DB: Yeah, I think I’d say a number of things. One is that it’s important to find the people who are more interested in action than talking – people who’re not afraid to do work with shovels and pitchforks. I think the danger sign would be that instead, people want to talk about doing a bunch of fliers, making a website, developing stickers, and planning out how to get to thirty different restaurants, or fifty different households. One story I can tell you is that I had a couple of individuals who were very excited about doing this, and that’s the road they went down. They started making all these big, huge plans that were taking months and months of planning. And I said, “Well, why don’t you try doing a pickup from just one restaurant, and getting that process. Just try that for me to see if you can do that, because if you know you can’t do that, then you shouldn’t be making all these plans”. And it turned out they couldn’t do it. So, for folks who are interested, that’s a good test. And that leads to my second piece of advice, which is to start small. Many people feel like they have to have it all planned out and go big, whereas if you just start with one or two restaurants, or maybe a dozen households – see if you can do that first, and control odours and rats. And if you can, that’s fantastic and you can build up and get bigger. But don’t spend all this time making big plans, when really you’re not able to pull off the practicalities of it all yet. And then the last thing I would say is to be guided by a strong vision for what you want to achieve, because so many people will tell you all the different obstacles in the way. Like, “There’s not enough land”, you know, “You can’t have odours, you can’t have rats”. When, if there’s a strong vision which says community composting will be what we have to do in the future, because it’s environmentally the most sustainable and keeps the organics as close as possible in the loop…if you just remember that vision when people say all the negative things, you can say “Well, I know that might mean it takes us longer, but we know we’re going to get there”. And then they can keep up their good spirits. They’re on the right side of history!